Firstly my izimvo buddy, Shaun Trennery, whipped up a fantastic Google Chrome extension called ZA Weather. The extension shows you the weekly forecast, automagically based on your IP address. Shaun has used some clever YQL to get the info, and the extension is amazing. 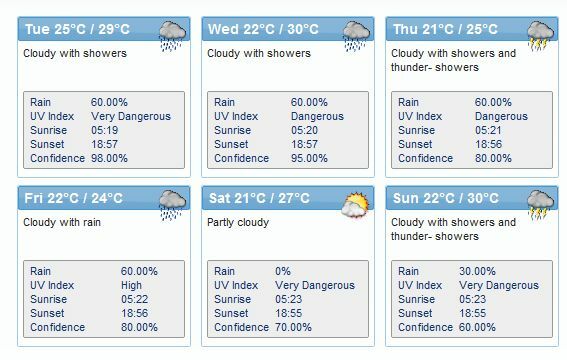 This is what our weather will look like this week in Durbs. The 2nd extension, released this morning, is from wunderkind Kishyr, from immedia. immedia are better known for their fantastic iPhone apps they have developed, and they have now just added to one of their most popular iPhone apps, ZATV Guide, and have launched the ZATV chrome extension. 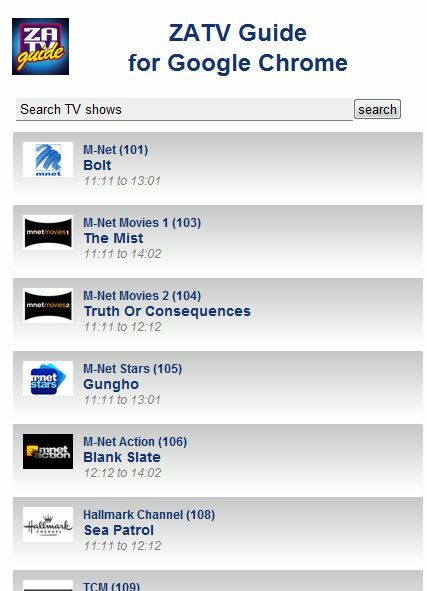 Basically, you can see what is showing RIGHT NOW on all the DSTV channels, as well as what is coming up in the next day or so. Added to this, you get full info on the shows that are coming up and showing at the moment. There is also awesome search functionality built into the extension, that allows you to search for a show or movie coming up. I have mailed these comments on the ZATV extension to the developers. 1. It’s slow to open and needs some indication that the user should wait. I clicked the button several times when it appeared that nothing was happening. 2. It’s a bit useless to me as the schedule listing is flooded with DSTV channels and I’m not a subscriber. I think an option to turn off display of pay channel listings would be useful. The SABC3 schedule for today is also not correct so the source for show info might not be quite up to date. Just had a reply to my e-mail and the issues I raised are being addressed.